when you were the one who starred in "Step Up"? Didactic and overwrought, Stop-Loss serves as this month’s Iraq War Movie™, assailing the military practice of involuntarily extending a serviceman’s enlistment beyond the end of their normal end of service. If nobility of intent were the sole indicator of a good movie, then Stop-Loss would be Oscar-worthy. Unfortunately, it merely serves as yet further proof that, like World War II and the Vietnam War before it, the golden era of war films comes only with the passage of time and historical objectivity. Critics of the Iraq War may well be proven right, but the fervor – and vacillations – of contemporary public opinion are never a reliable determiner of artistic expression. 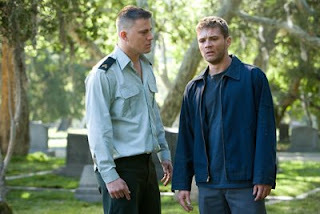 Ryan Phillippe plays Brandon King, an Army staff sergeant who, after two tours in Iraq, is stop-lossed from his expected discharge. The film jumps its rails the moment Brandon, rather improbably, escapes from the base stockade, steals a jeep, and goes AWOL. You can easily, and understandably, believe that many soldiers would react to this involuntary, so-called "back-door draft" with incredulity, anger, and even desertion. You just do not buy into the idea that this soldier, established during the film's taut opening act – a bloody firefight with Iraqi insurgents – as a decorated war hero, would react that way. The fact that Brandon is not married and has no children at home strips away yet another potential justification for his actions, leaving only the plaintive declaration that “I’m tired of killin’.” The bulk of the remaining narrative comprises Brandon’s road trip to seek help from a U.S. Senator, visit a buddy rehabbing in a VA hospital, and flirt with defection to Canada. Along with the involvement of director Kimberly Peirce (this being her first feature release since 1999’s Boys Don’t Cry), lefties will find the film appealing as a means to lambaste Bush’s war while also paying respect to the soldiers. Frankly, the film does not effectively accomplish either goal. Brandon and his band of Texas-based brothers are cast as beer-swelling, gun-toting, rattlesnake-grilling stereotypes, while Brandon’s actions will be regarded by many viewers as rather ignoble. Beyond the leads, however, the most fascinating performance belongs to rising star Joseph Gordon-Levitt (The Lookout), who portrays a returning soldier beset by the demons of alcohol and the horrors of war. The remaining cast is generally satisfactory, except for some southern-fried accents that tend to deepen depending on the dialogue or setting. Stop-Loss’s finale firmly ensconces the film as a big, melodramatic waste of time. Let’s pray the same thing is not definitively said one day - although I fear it will - about the real-life war it depicts and the governmental policies it lays bare.